The United States women’s national team ended Friday’s game against Germany the way it began the match: in absolute chaos. Germany scored goals in the 85th and 87th minutes to tie the US 3-3 in Offenbach, Germany. Abby Wambach opened the scoring in the 47th minute — her 155th career international goal, three away from tying Mia Hamm’s record — and Megan Rapinoe and Alex Morgan each added spectacular strikes for the US. Kim Kulig cut the US lead to 2-1 in the 63rd minute following Rapinoe’s half-volley, but Morgan’s brilliant chip in the 71st minute looked like it iced the game for the United States. Defensive breakdowns blew the result for the United States, however. Celia Okoyino da Mbabi earned a penalty kick and finished it in the 85th minute and Anja Mittag slammed a shot past US goalkeeper Nicole Barnhart two minutes later to tie the game at 3-3. The frantic ending for the US was just like the match started, except unlike the start of the match, the Americans conceded. 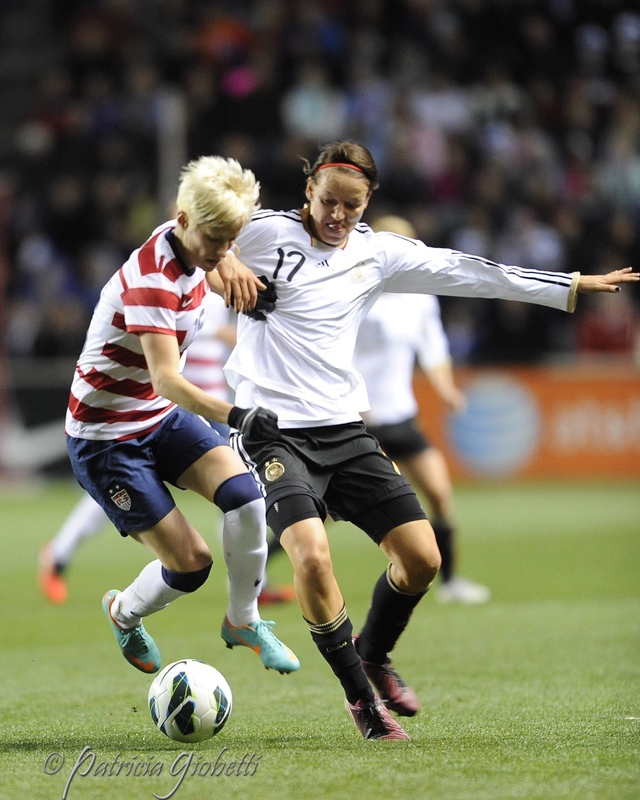 Germany put a young US back line to the test from the start, targeting 22-year-old left back Kristie Mewis. Leonie Maier gave Mewis fits down Germany’s right flank and the United States failed to piece together much of anything by way of an attack. An isolated effort from Alex Morgan is the only attacking chance the U.S. had in the opening 30 minutes. Germany collected the consistent long ball attempts from the US and restarted their attack immediately, not allowing the Americans to clear their lines. 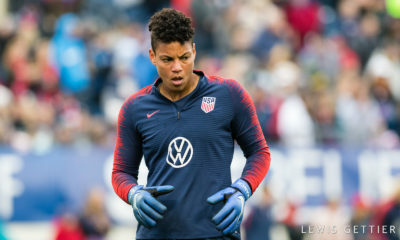 Lauren Cheney had the best chance of the half in the 33rd minute when Morgan turned the corner and played a negative ball to Cheney, whose shot from 8 yards out went straight into the hands of German goalkeeper Nadine Angerer. A scoreless opening 45 minutes gave away to the flurry of goals in the second half. Wambach opened the scoring just two minutes after halftime when she headed in Rapinoe’s cross. Nine minutes later, Rapinoe was on the receiving end of Wambach’s assist when she doubled the US lead in the 56th minute. 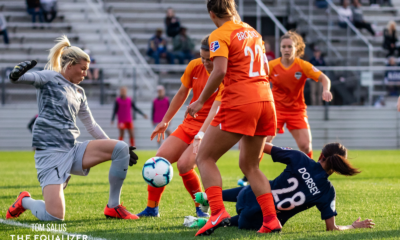 Kulig cut that lead in half seven minutes later when she took advantage of a poor Crystal Dunn clearance, but the shift in momentum was short-lived. 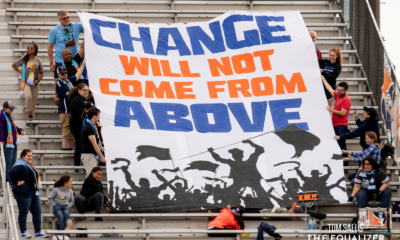 Cheney finished a Rapinoe free kick with a strong header in the 66th minute, but was mysteriously whistled offside. Wambach and Shannon Boxx were offside, but both were uninvolved in the play. Morgan’s goal came in the 71st minute when Cheney curled in a perfect through ball from midfield and Morgan found herself alone against Angerer. The 23-year-old calmly chipped Angerer from just inside the 18-yard box to give the US a 3-1 lead before Germany’s two quick strikes. Sydney Leroux, who entered the match for Abby Wambach in the 80th minute, nearly scored the winner in the 94th minute on a header, but Verena Faisst cleared the ball off the line for Germany. The United States will next play the Netherlands at 1 p.m. ET on Tuesday in The Haag, Netherlands. The US is now 4-1-1 all-time in Germany.